A Saturday night in late October approached last call in Jasper Alberta. The little town nestled her bar hopping drunken tourists among titanic black mountains. The scene was lit by a full moon. You could clearly see the dark shapes of people wandering from pub to pub. I could also see clearly the white CN security truck racing up and down the rail yard about every half hour. I sat silently in the middle of a park where the tourist booth was. It was directly across the street from the VIA rail station and rail yard. I had been here now for three hours waiting for a westbound freight to arrive. I had actually caught out in this same train yard more than a year before. But it was not alone and my main aim was to accomplish my first solo hop. After interviewing several "train hoppers" in recent years I had felt a strong surge of wanderlust in my guts - I just had to go and experience it too... I had to do it. And do it alone. The stories especially of the young people I had branded "the Wanderers", mostly from Ontario, had enlivened and inspired me. My second goal was to keep in touch with the young people, mostly in their mid to late twenties who I had met in Winnipeg earlier that year. It was unusually to find so many train hoppers in one place at one time because they usually travelled solo or in twos only. But in Winnipeg in mid summer of 2004 there were about fifteen and they all knew each other. It had been like a family reunion. As I journal these train hoppers I am always amazed at how similar they are to the hoboes of old. They even have similar virtues and traditions like sharing and caring for each other. Many work part time, many squeegee too. There is a special bond between them that hardship and travel have honed into their colorful characters. I later found about five of them in Vancouver and will write about them in separate articles. Mackie and Dustin were there in Vancouver with Justin. Digger, from Scotland, was in Victoria. Having scouted the rail yard for three days now I felt confident that I could "catch out" without much trouble. They say you spend fifty percent of your time just waiting and watching when train hopping. The preceding two days I had been alarmed several times but I don't know if it was paranoia or lack of experience or both. I had felt sure that when I walked along the tracks and along the long dike that separated the town from the rail yard a security truck would show up. Did they have infrared goggles? Another thing: The Parks Canada truck would show up too and even shone its spotlight towards me. I was told later that it was just paranoia. CN didn't use infrared glasses. But just to be on the safe side I decided to stash my backpack in the bushes near the tracks where I would try and hop the train. I sat directly across the street in the park where I could watch both the bush and the rail yard. It worked well. I was counting on the full moon to help me see to manoeuvre too. It was a strategy that worked well on D-Day but maybe I would just be a better target for security too. I sat again and took a big gulp of Southern Comfort for courage. The train slowed. It had two engines and the cars were all grain cars. A good sign for me. 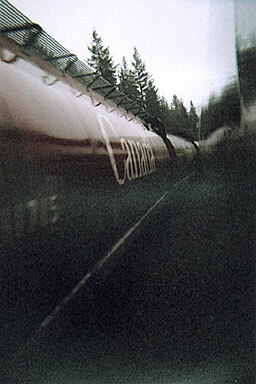 Many grain trains went to Prince Rupert to the shipping terminal there. I wanted to go to Rupert more than I wanted to go south to Vancouver. But it would be a gamble - Most trains went south to Kamloops and Vancouver. The train stopped. I knew I only had about ten minutes. That's about the time it takes the crews to change in Jasper. By law train crews must change every twelve hours. I stood and casually walked across the street and over to the bush where my pack was. I held my briefcase in my hand. I immediately picked up the pack and put it on in one motion. I then walked quickly to the train which was about four tracks out from the side. Because of lack of experience I made a couple of mistakes immediately. I climbed on the first grain car I saw - It was not good for riding. It had big air brake machinery on the platform. I threw my pack off and headed to the next car. 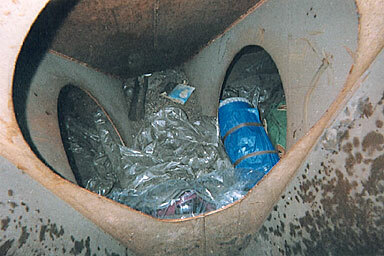 Again I made a mistake - I threw my pack up on the platform and looked inside. The insides had holes in the floors. Again not good. So I threw my pack off again. This time I left the pack on the ground and climbed on board. The platform was flat and clear, inside there was a flat floor. Good one! I scampered off and threw my pack up and then inside in the hole to the left. I climbed into the hole on the right. I hadn't been in for more than a minute when I heard... psssssst! The air brakes were being released. Then Clang! The slack was being taken up. We were moving already. Soon we were going twenty miles per hour. I saw the VIA Rail station go by then the train turned west and over the intersection that leads to the highway. We were rolling! I remembered the ear plugs in my hip pocket and put them in. It is deafening without them. I felt like a kid on Christmas day - I was giddy with excitement. I climbed out after only five minutes inside and was welcomed on the platform with a real Christmas scene. Snow covered gigantic Fir trees wiped by on either side illuminated by the full moon. I pulled out my mickey of Southern Comfort and chugged on it. Sitting cross legged on the platform I drank in the beautiful panorama. I howled at the full moon. Unfortunately, the disposable cameras I had brought were insufficient to capture the low lit trees. Even at 800 ASA it was too dark to capture. I soon had to hide in my hole again. The train slowed and a CN worker on the side of the tracks looked directly at me. I don't know if he saw me in my hole or not. The train stopped at least six times to let other high priority trains go past heading east. I soon tired and fell asleep. I was quite comfortable even though there is only about four square feet in either hole. The train. 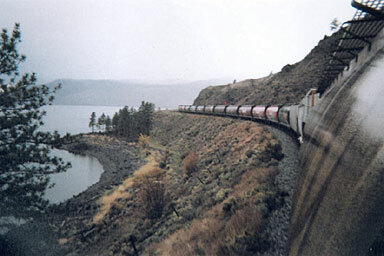 The train eventually stopped in Kamloops around 4:00 pm and the crew changed in about half an hour. 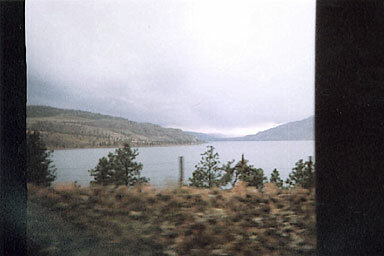 I was a bit disappointed when I learned the best scenery was south of Kamloops and that I only had about five frames left in the one disposable camera. I had used disposables for one reason. Everything tends to brake or get torn when train hopping, not to mention getting filthy and full of rust. Into the Fraser Canyon and in late afternoon the view was stunning. Three hundred feet above the raging Fraser River the train clung to the canyon walls and slithered through several tunnels as well. Next time I will leave earlier and bring more film. As night approached I hid on my hole and tried to get a radio station on my cheap transistor radio. It was useless, too noisy and no stations anyway. As we headed south and on past Hope, Hope BC that is, the train picked up speed and travelled probably fifty miles per hour - it seems anyway. We were definitely high balling towards Vancouver. It began to rain not surprisingly. As we passed Chilliwack BC I noticed an alarming number of large train yards with huge spotlights. And if that was not bad enough, not just barbed wire topped fences but razor wire topped fences! We sped past several factories that spewed out billowing white smoke. One factory had large pipes with fire coming out the tops. It seemed like a science fiction movie scene. I thought these yards would never end. I had visions of giving myself up to uniformed authorities and being handed several fines and being driven off the property by police. But after what seemed like an eternity the train finally slowed noticeably and turned a corner where the lights seems to dim. It was stopping! My pulse began to race as it had when I first hoped on board. I have to jump. Now! I scampered out of my hole and dragged my backpack out of the hole. I threw it to the ground and followed it. I was very careful though. I inched down the ladder and grabbed each rung tightly. The train had stopped. I noticed a security yard behind and a large tower ahead about one hundred yards. I hurried to the edge of the tacks where an extremely high and steep bank loomed. It was more like a cliff really. I stepped over a cement curb and into some vegetation. I stood there for a moment and holding my briefcase up and both arms outstretched like a scarecrow I realized I was standing in the middle of a bunch of Devil's Clubs with huge thorns. But as I stood there I also felt a sense of relief. Across the tracks on the other side was a big body of water and up above it was something I remember seeing every day as a youth growing up in east Vancouver - the lights of Grouse Mountain! I must be in Burnaby, not far from Vancouver. I very slowly extracted myself from the thicket of thorns and slowly proceeded west down the tracks. I couldn't go back and I was afraid to run into security ahead at the big tower. I looked up ad saw a few black lines going up the slope. "Must be paths" I thought. Approaching one of them I realized they were paths but so steep they must be hard to climb even in summer! Scrambling and falling up I saw a big nylon rope. Grabbing it I pulled myself and my 20 lb back pack and my 10 lb briefcase up. After about fifty feet I discovered I was not even halfway up! I was already tired and wheezing. On top of it rain started to fall slightly. "Got to go" I thought. "Only one way"... I grappled with vines and pulled and stumbled upwards. I stopped about each ten feet. I was becoming very tired now. After another eternity I reached the top. I felt like my heart would explode and I could hardly catch my breath. Was I having a heart attack? Finally I got my breathing back and at the top I threw my pack off and crumpled on top of it - completely exhausted. Then the rain stared to pour down in buckets. Cold rain. I sat dejected and totally bereft of strength. I only had enough strength left to pull on a rain slick and cover my pack with a garbage bag. No strength left. So I sat there resting for about twenty minutes. I looked down at my hands and they were black as coal. Just like the kids I had seen in Winnipeg. Black fingernails. I looked at my shoes, both were torn. My pants were torn and my back pack was also slightly damaged. I wondered what my face must look like. But then I looked up and saw the beautiful lights of North Vancouver and Grouse Mountain. I realized I had done it - alone. A large grin crept across my filthy, mud covered face and it was uncontrollable. I sat there in the pouring rain with this big grin. Fortunately the rain stopped as quickly as it had begun. I pulled out my bottle of water. I was dying of thirst. I gulped down every last drop. Gathering what strength I had left I pulled on my pack and picked up my briefcase. I walked along a path looking for civilization. I soon found it. Rounding a corner of a big hedge I found myself standing in the middle of a back yard. A back yard full of big patio lanterns and oil lit lamps. There were several people standing in the patio. They were all holding wine glasses; some wore pretty evening gowns... some of the men sported tuxedos. "Pardon me," I said, "Can anyone direct me to a payphone? I have just crawled off a freight train and need to get to my sisters house in Port Moody." For the longest time no one said anything but merely stared. Then a rather handsome looking middle aged woman with a lovely pink evening gown responded. "If you walk that way you will reach Hastings Street. Perhaps there is a pay phone there." The others just stood and stared. "Is this Burnaby?' I asked. "Yes, yes it is," the lady responded. "North Burnaby." "Well... Happy Halloween," I said. I turned and trudged off in search of the payphone.